Cancer survivor Brooke Gant tells us about her experiences with chemotherapy. In 2017, I started off being a normal, very active, fit young woman. I was also newly married with lots of goals and plans for the future. All of that quickly changed when I was rushed to the emergency room with extreme hip and abdominal pain. Fast forward a couple of weeks and I was being wheeled into an operating room. Fears of what I could potentially wake up to were flooding my mind. I was only 32 with a large mass on my ovary, but I instinctively knew that I would wake up to a cancer diagnosis. I never thought I would face a serious illness since I had always been healthy. Yet here I was, very aware that my life was about to change forever. I was dreading that chemotherapy would likely be in my near future. I was indeed, diagnosed with a rare and aggressive form of ovarian cancer, clear cell, and I was prescribed six rounds of an intense chemo regimen. Initially, I couldn’t even say the word chemo. I immediately informed friends and family to refer to it as my “treatment”. That word didn’t seem quite as scary – it didn’t have the same negative connotation. I definitely viewed it as a necessary evil. It was causing me to put my life on hold. It was robbing me of my passions, future plans, and everything that made me an independent, outgoing woman. I loved working out, having long, flowing hair, and being able to do what I wanted when I wanted without a care in the world. I was looking forward to one day having children with my husband and us growing old together. According to me, chemo was going to take all of that away. I would become too weak to exercise, be completely bald, and I had to be careful where I went so I wouldn’t get sick. Not only that, but I lost my fertility and had no idea if I would ever have the opportunity to spend a long life with my husband. Rather than solely blaming cancer for these changes, I blamed a majority of it on chemotherapy. As I went into the chemo room for the first time, I had a total breakdown. It was intimidating to see the machines and chairs lined up. I saw all of these tubes that would flush toxins into my body, and I burst out crying. I felt like I was trapped in a nightmare. I thought if cancer didn’t kill me then these drugs surely would. I had acquaintances, who thought they were helping me, constantly reminding me that I was “harming” my body with my treatment choice. I was certain that I would never have a positive opinion of the drugs being used to treat my condition. However, my experience began to change how I viewed it all. My oncologist, nurses and other patients were so kind and supportive. I expected it to be a gloomy, depressing room, but instead there were jokes, laughter and love with total strangers. It became a safe place that was initially making me feel ill, but eventually would be what gave me my health and life back. I began to view my chemotherapy drugs as my lifeline and not as poison. I eventually learned to dance in the rain – at least, the best I could. I saw that I was losing my physical strength, but I was building inner strength. Yes, I still had fears. I was insecure and disliked all of the changes I was going through, but altering my perspective on my treatment helped me to get through an extraordinarily difficult time in my life. When chemo was over, it was overwhelming to try and pick up the pieces. I often felt defeated. I thought while everyone else my age was living life during the past seven months, my life had been put on hold. I had to work on the physical and emotional recovery as well as to create new future plans. Cancer wreaked havoc on my life, and I felt I was starting over again. I had no idea how to even begin, but at least at this point I knew it was cancer to blame. What helped me get through this tough time was focusing on how blessed I was that these brutal drugs had given me the chance to put myself back together. Ultimately they saved my life, thus I was able become a more empathetic, understanding, and loving woman who stresses less and is happier than ever. Yes, I temporarily lost who I was, but I gained it all back in spades. This experience transformed me more than I can express, which initially scared me. I liked who I was, but I ended up loving who I’ve become. I wish I had never gone through this, but I am grateful for the new perspective on cancer treatments. I will forever be appreciative to the doctors, nurses, and medicines that gave me back my health. Thanks to everyone who helped me and the chemotherapy drugs given, I can now proudly describe myself as an ovarian cancer survivor and advocate. 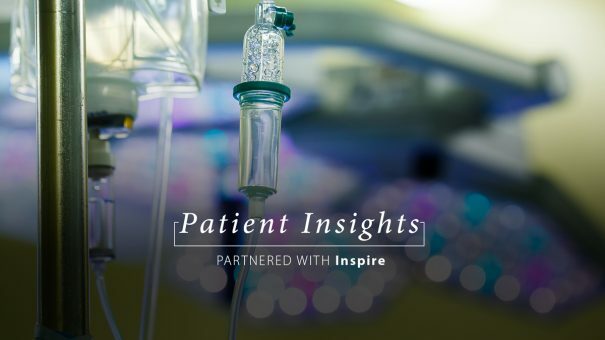 Patient Insights is a monthly series that appears in partnership with Inspire, a company with an online support community of more than 1.5 million patients and caregivers worldwide.